Description: This is a multistemmed shrub that becomes 3-12' tall. The crown is often as wide as it is tall and it is well-rounded overall; the abundant branches are somewhat arching to spreading. On older shrubs, the oldest branches toward their bases develop a coarse rough bark that is brownish gray; this bark often peels into narrow strips. On younger shrubs, the oldest lower branches are relatively smooth; they have narrow strips of dark gray and pale brown that don't peel. Upper branches and twigs are relatively smooth and brownish gray, while young shoots are light green or light reddish green, terete, and pubescent. Young shoots and twigs are also hollow. Pairs of opposite leaves occur along young shoots and twigs. 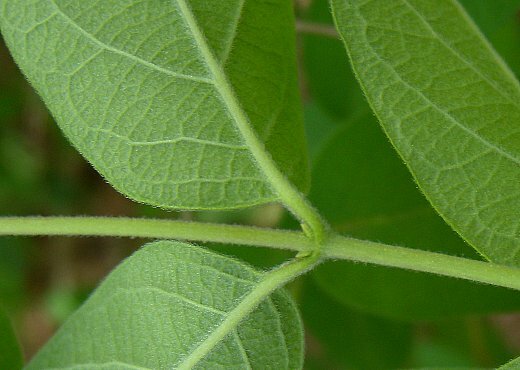 These leaves are 1–2½" long and lanceolate-ovate, lanceolate-oblong, or elliptic in shape, while their margins are entire (smooth). The leaves are widest at, or below, the middle. Leaf tips are acute, while leaf bases are rounded or slightly cordate. The upper leaf surface is medium green and hairless, while the lower leaf surface is whitish green and short-pubescent, especially along the larger veins. The short petioles are up to ¼" long, light green to light reddish green, and short-pubescent. Pairs of flowers develop from the axils of leaves on short peduncles (about 1/3" or 1 cm. in length); these peduncles are longer than the petioles. The peduncles are light green to light reddish green and short-pubescent. Each flower is about ¾–1" across, consisting of a light pink corolla with spreading lobes (less often it is white), a short green calyx with 5 teeth, 5 stamens, and an inferior green ovary with a single style and knobby stigma that is light green to light yellow. As it ages, the corolla becomes creamy yellow. The corolla has an upper lobe (actually 2 lobes that are joined together), 2 lateral lobes, and a lower lobe. The lateral and lower lobes are narrowly oblanceolate, while the upper lobe is oblong and sometimes slightly notched at its tip. The stamens have white to pinkish white filaments and bright yellow anthers. The ovary is ovoid-globoid in shape and a little less than ¼" long. Underneath the ovary of each flower, there are a pair of inner bractlets and a pair of outer bracts; the inner bractlets are oval-ovate and shorter than the ovary, while the outer bracts are linear-oblong and about the same length or a little longer than the ovary. The blooming period occurs during the late spring, lasting about 2 weeks. Afterwards, the flowers are replaced by berries that become mature during the late summer or autumn. Mature berries are about 1/3" (8 mm.) across, globoid in shape, and bright red; the juicy interior of these berries contains 2-6 seeds. The seeds are ovoid and somewhat flattened in shape. The woody root system is shallow and spreading. This shrub can reproduce clonally by forming offsets (new shoots) near its base, and it can also reproduce by layering when the lower branches have contact with moist ground. Cultivation: The preference is full sun to medium shade, moist to dry-mesic conditions, and soil containing loam, clay-loam, silty loam, or sandy loam. 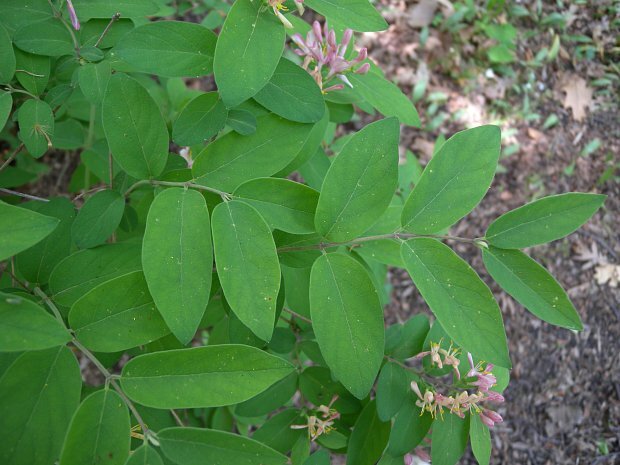 In general, this shrub is very adaptable; it develops quickly and lives for about 10-35 years in the wild. Young shrubs can produce flowers and berries in as little as 3 years. Winter hardiness extends to Zone 4. This shrub is invasive and it should not be cultivated in Illinois. It can be controlled by cutting the lower branches of the shrub to its base and applying an herbicide to the stumps. Range & Habitat: The non-native Showy Honeysuckle is occasional in NE and north-central Illinois, while elsewhere within the state it is uncommon (see Distribution Map). However, because it can be confused with its parent species and possibly other hybrids, Showy Honeysuckle may be more common within the state than official records indicate. This hybrid shrub may have been introduced into North America from Europe, or it may have have been developed within North America by the horticultural industry. The parent species, Tatarian Honeysuckle (Lonicera tatarica) is native to eastern Europe and western Asia, while Morrow's Honeysuckle (Lonicera morrowii) is native to Japan. 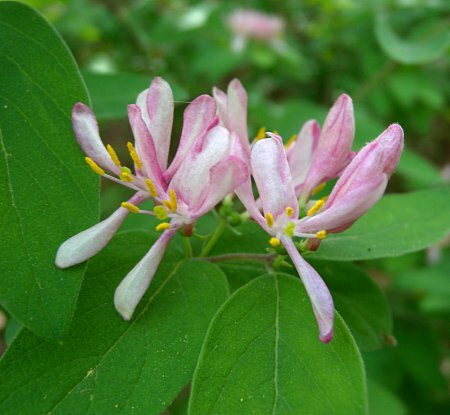 Wild shrubs of Showy Honeysuckle in Illinois may be naturally occurring hybrids, or they may derive from the dispersed berries of cultivated plants. Habitats include woodlands, woodland openings, woodland borders, meadows in wooded areas, powerline clearances in wooded areas, banks of streams and rivers, thickets, roadsides, areas along railroads, abandoned or fallow fields, vacant lots, and fence rows. Showy Honeysuckle is typically found in disturbed or degraded habitats, although it has the capacity to invade high quality natural areas. Faunal Associations: The flowers are cross-pollinated primarily by bumblebees and other long-tongued bees; the Ruby-throated Hummingbird may visit the flowers as well. Both nectar and pollen are available as floral rewards. Some insects feed on the leaves and sap of honeysuckle shrubs (Lonicera spp.) from Eurasia. The following Eurasian aphids curl the leaves of such shrubs during the spring: Hyadaphis foeniculi (Honeysuckle-Fennel Aphid), Hyadaphis passerinii (Honeysuckle Aphid), Hyadaphis tatarica (Honeysuckle Witch's Broom Aphid), Rhopalomyzus lonicerae (Reed Canary Grass & Honeysuckle Aphid), and Rhopalomyzus poae (Honeysuckle-Grass Aphid). Other insect feeders from Eurasia include leaf-eating larvae of a sawfly (Zaraea lonicerae) and leaf-mining larvae of a moth (Perittia herrichiella). The larvae of a leaf-mining fly (Paraphytomyza luteoscutellata) also feed on these shrubs; see Blackman & Eastop (2013), Smith (2006), Microleps website (2010), and Spencer & Steyskal (1986). The red berries of honeysuckle shrubs from Eurasia are eaten by several frugivorous songbirds, including the American Robin, Cedar Waxwing, European Starling, Hermit Thrush, Gray-cheeked Thrush, Swainson's Thrush, Gray Catbird, Northern Cardinal, and White-throated Sparrow. White-tailed Deer browse on the leaves, twigs, and berries of these shrubs, although they are not preferred as sources of food. Both birds and deer spread the seeds in their droppings, introducing these shrubs into new areas (Myers et al., 2004; Munger, 2005). Showy Honeysuckle and other Eurasian honeysuckle shrubs provide nesting habitat for songbirds, and protective cover for both birds and small mammals. Photographic Location: Along a partially shaded roadside within Crystal Lake Park in Urbana, Illinois. Comments: Showy Honeysuckle (Lonicera × bella) is one of several honeysuckle shrubs (Lonicera spp.) that have been introduced or developed by the horticultural industry. Distinguishing the various species and their hybrids can be difficult. Showy Honeysuckle has attractive flowers, foliage, and berries, but it can spread aggressively. Some sources refer to this shrub as Bell's Honeysuckle, however it was not named after a person with 'Bell' as a last name (if this was the case, then the species name would be 'belli' or 'bellii'). Instead, 'bella' is a Latin word meaning 'beautiful' or 'showy.' Showy Honeysuckle can be distinguished from one of its parent species, Tatarian Honeysuckle (Lonicera tatarica), by its light pink flowers (less often white) and the pubescence on its young shoots and leaf undersides. 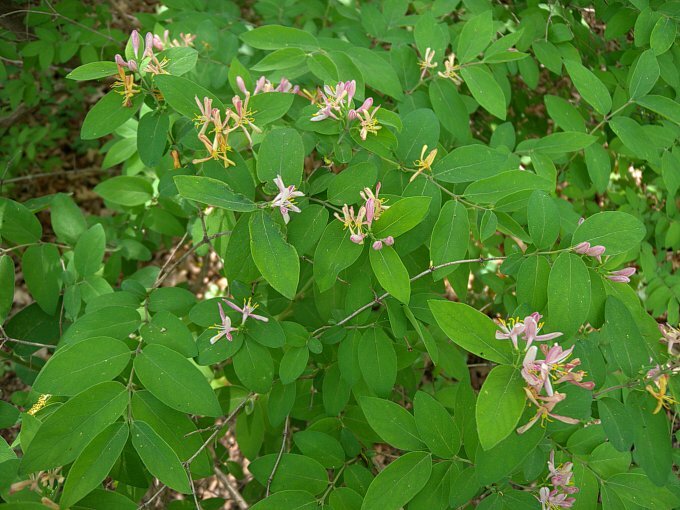 In contrast, Tatarian Honeysuckle typically has rosy pink flowers (less often pink) and its foliage is hairless. Showy Honeysuckle can be distinguished from its other parent species, Morrow's Honeysuckle (Lonicera morrowii), by its light pink flowers and slightly less hairy leaves; the underside of the leaves of the latter shrub is more whitened from dense pubescence, and the upper side of its leaves is slightly canescent from very short fine hairs. 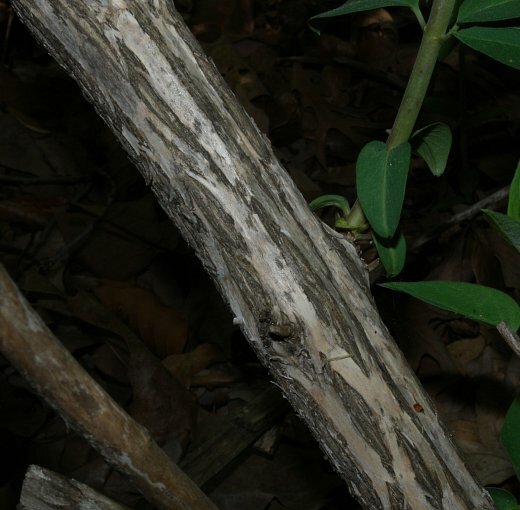 In addition, the leaves of Showy Honeysuckle are more likely to have acute tips and slightly cordate to truncate bases, while the leaves of Morrow's Honeysuckle are more like to have tapered rounded tips and rounded bases. Another common species, Amur Honeysuckle (Lonicera maackii), differs from Showy Honeysuckle by having white flowers, flowers and fruits that are nearly sessile, and leaves that are more acuminate (with slender acute tips). Other honeysuckle shrubs can be distinguished by their smaller flowers, floral bracts, and other characteristics.